Samsung had to recall its Galaxy Note 7 mobile phones immediately after its launch because there were numerous reports that some of these gadgets are exploding. 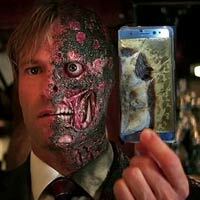 It’s a bad day for Samsung, no doubt, but not surprisingly some folks took it to the internet to make fun of the device. Many hilarious memes have been created with a little photoshopping and a lot of humor. Please Note: This is in no way an anti-Samsung article.